The executive published its €30m Winter Plan for 2018/19 today. THE HEALTH SERVICE Executive says the success of its winter plan will be judged on how quickly emergency department patients can be seen – but has no targets for doing so. The executive published its €30m Winter Plan for 2018/19 today, which aims to support older people and assist in their transition from acute settings. The plan focuses on ensuring the executive is prepared for an increased number of patient attendances until 31 March, and will create additional support for support acute and community operations as well as a four-week period of enhanced measures across nine sites from 17 December to 13 January. The plan will also seek to increase bed capacity in 2019, and see 78 beds open next year. 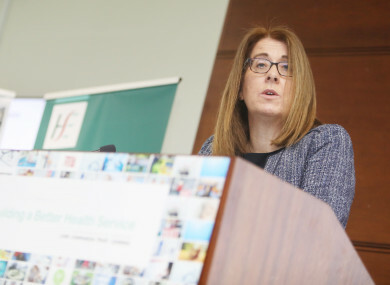 Speaking at the launch this afternoon, the HSE’s Deputy Director of General Operations Anne O’Connor said it could not control the number of people who would show up to emergency departments this winter, but said it could improve their experience. “The big focus for us is to reduce the length of time that people spend in emergency departments, and that while they are in emergency departments, that all of their needs can be met,” she said. “For us a sign of success would be … can we see people as quickly as possible, turn people around … and can we move them from emergency departments and into beds if they require admissions? However, O’Connor added that target times for patients to be seen were still being negotiated with individual health facilities, and that these targets were not part of the Winter Plan. Welcoming the plan, Minister for Health Simon Harris Minister Harris said tackling emergency department waiting lists were a challenge to those working across the heath service. “While the coming months will be very challenging, this plan represents a system-wide response to this challenge across the health service,” he said. Email “HSE wants to see patients as quickly as possible this winter - but admits it has no targets to do so”. Feedback on “HSE wants to see patients as quickly as possible this winter - but admits it has no targets to do so”.